'He loved it and when we got home he asked me for these items and then did this! Very proud of himself! Thanks!!! Thank you for putting up with rsvps, cancellations, and last minuet rsvps! :) Thank you for understanding when I was a late arrival with two girls; probably the first first rule of etiquette don't be late! (: Thanks so much! The girls had fun and so did the parents! My daughter, Chloe, had a great time and remembered what she learned as she corrected her baby brother at dinner time. (: thanks again for a fun and educational girl scout event! Thank you so much for presenting an outstanding series of etiquette lessons at Riviera Hall Lutheran School! Mrs. Nollan and I have received wonderful feedback from our students, teachers and parents, and you classes have such an invaluable extension of our students education. Your engaging techniques developed essential social skills and provided our students with the tools to help build their confidence and self-esteem. We greatly appreciate you sharing your expertise and experience with us, and we look forward to placing another session with you again. On a personal note, I really enjoyed getting to know you and I was inspired by your enthusiasm and uplifting values! I want to take this opportunity to thank you for the wonderful program you brought to our school this fall, "Polite Is Right". It was a terrific addition to our lineup of after-school enrichment classes. We look forward to the class you will be giving later this fall to our older students. Many thanks! We are writing to you today to let you know that we are extremely happy with the Enrichment sessions. Your professionalism, enthusiasm and expertise have created a program that excites and expands the knowledge of the students in the Palos Verdes Peninsula Unified School District. We know that we can expect another incredible year in the Enrichment Program and we look forward to seeing you soon. My daughter was going to meet the head master at her new private school, Chadwick. I told her to try not to be nervous when you meet him. She said, "Mom I took Polite Is Right, I know the right way to shake his hand and talk with him, I will be fine." 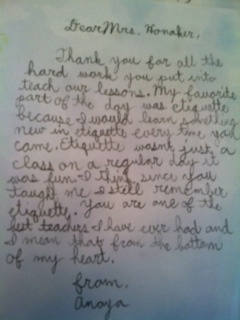 For the last 3 years my child took Polite Is Right. He loves it! My boys, ages 10 and 14, went to Polite Is Right's summer workshop. They did not want to go. But, after the classes, they set the table at home and even pulled my chair out in a restaurant. I was so proud of them. We are pleased to be collaborating with you this summer to provide quality experiences for children attending our summer camps. We are looking forward to working with you again this summer. Thank you for helping us to build strong kids, strong families and strong communities. It was wonderful having you at Pacific. The children loved your classes! Thank you for teaching me the right and polite way to eat, speak and not leave anyone out of an activity or an event. I really had sooo much fun!!! 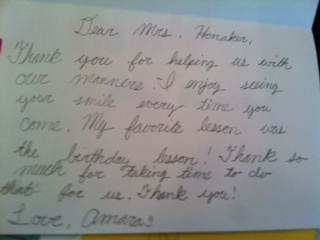 Dear Mrs. Honaker, Thank you for teaching my students about proper behavior and manners. 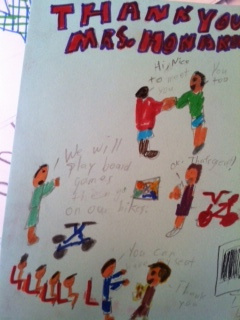 You discussed interesting topics and the children looked forward to your visits. Hopefully the students will use these new skills off our campus ,too.